Eric Chevillard’s visionary play of word and thought has been compared to the work of Beckett, Michaux, and Pinget, yet the universe he spins is utterly his own. 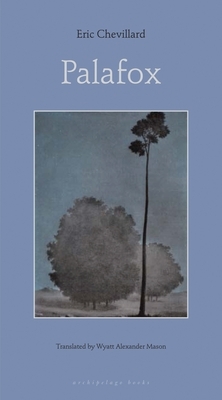 Palafox (Editions de Minuit, 1990), Chevillard’s third novel of eleven, explores the ecosystem of an unclassifiable yet enchanting protean creature, Palafox. A team of experts armed with degrees of higher learning is determined to label, train, baptize, and realize the elusive creature, while Palafox effortlessly and wordlessly defies them all. Eric Chevillard is one of the most inventive authors writing in French today. His novels include On the Ceiling, The Crab Nebula, and Demolishing Nisard, all translated by Jordan Stump, and Palafox (Archipelago), translated by Wyatt Mason. Wyatt Mason has translated several books by Pierre Michon, including Masters and Servants (Mercury House, 1997) and The Origin of the World (Mercury House, 2002). His edition of Rimbaud’s complete works in two volumes, Rimbaud Complete and I Promise to be Good, is published by Modern Library. In 2003, he was named a Fellow of the Dorothy and Lewis B. Cullman Center for Scholars and Writers of the New York Public Library.